Gov. and Mrs. John Bel Edwards greeted Marion Johnston in the Fleur de Lis Bedroom. 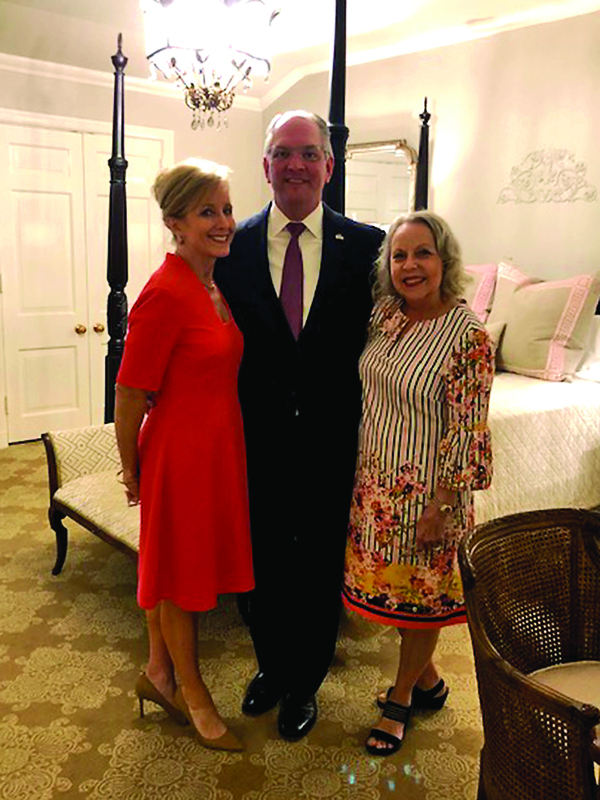 A long-overdue refurbishing of the Louisiana Governor’s Mansion is complete and a Natchitoches designer was part of the project. Marion Johnston says that about a year and a half ago, several licensed interior designers from around the state were asked by First Lady Donna Edwards and the Governor’s Mansion Preservation Foundation to participate in a project to update the private spaces of the Louisiana Governor’s Mansion. First Lady Donna Edwards, bottom left, recognized designers who were part of the project to refurbish the Governor’s Mansion. At top right is Marion Johnston. These rooms had not been redone since the 1990s. Johnston was placed on a team with two other interior designers to work on the Fleur de Lis guest bedroom. “Using an existing four poster bed and writing desk, we added new draperies, bedside tables, accent mirrors, a crystal chandelier and lamps. A chaise longue and bench were reupholstered and a custom-built entertainment wall unit was designed by Shelby Taylor, one of our team members.” The members of the design team for the Fleur de Lis bedroom were Missy Dubroc of Alexandria, Shelby Taylor of Shreveport and Johnston. All are professional members of the American Society of Interior Designers. Dubroc and Taylor are actively practicing interior design while Johnston has been retired for almost 10 years. This entertainment center was a custom design of designer Shelby Taylor. “We developed our color scheme and new furnishings plan together,” Johnston says. “Missy used her sources for ordering new furniture and fabrics and Shelby designed the custom entertainment center and provided working drawings so the unit could be built. “Missy said that I was the ‘glue that held the team together’ and kept the team moving forward by making visits to the mansion to monitor renovation progress, interfacing with the Foundation’s director and providing Foundation deadlines for the project.” Johnston says she felt honored to be chosen to participate in this project. “All the interior designers donated their time as well as securing donations and special pricing for new items that were specified. No taxpayer dollars were used on this project. A chaise lounge received new fabric. A four-poster bed is the focal point of the Fleur de Lis Bedroom. The Foundation uses a variety of events to help support the mansion. Engraved bricks are available to be placed on the grounds of the mansion to honor family and friends. In addition, First Lady Edwards has designed a set of state china that was purchased by private individuals and donated to the Governor’s Mansion collection. This historical set contains a design of 18 fleur de lis on the coffee cup representing Louisiana’s place as the 18th state and 64 fleur de lis on the dinner plate representing Louisiana’s 64 parishes. The set was created in a state blue and gold pattern. These items can be seen and purchased through the governor’s mansion website www.governorsmansion.org or by calling the Executive Director of the foundation, Sandy McClelland at 337-578-4063 or by email gmpfinc@gmail.com.